There are not many fantasy novels that have a female as a strong lead character. One such series I read awhile ago was The Enchanted Forest Chronicles by Patricia C. Wrede. 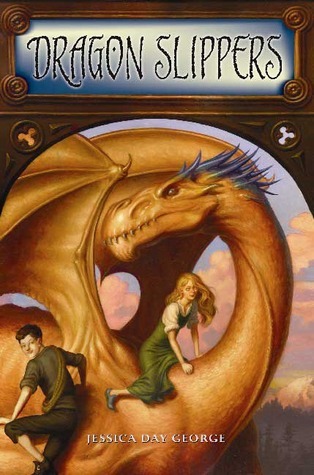 After being recommended to read Dragon Slippers on Goodreads I decided to look further into the series. Once I read a summary of the first book I decided to give it a try. I loved Wrede’s series so much that reading another series about dragons and a young girl as protagonist was very intriguing. I can say that the first book, Dragon Slippers, lived up to my expectations. It is not as good as Wrede’s series, but definitely an incredible story! I really enjoyed the unique plot to the story. It’s all about a pair of blue slippers that Creel was given by a dragon, and finding out what they really are. It was engaging and well paced. I even found that I liked all the discussions about embroidery and sewing even though I don’t care for them myself. Much of the story focuses on the shoes and Creel’s passion for embroidery, but don’t let that deter you from reading a great story! There are also themes of friendship, betrayal, and coming of age. There is a little bit of romance in the book, but nothing that would be inappropriate for younger readers or take away from the main story. There is also very little violence within the battles. In Dragon Slippers, Creel is the protagonist. She is a strong, courageous, vibrant, kind, and likable character. She handles herself very well in all the various situations she is put into. These include having a mean seamstress as a boss, dealing with a rude princess as a client, falling for a prince, befriending dragons, and saving the dragons and her people. Additionally, she is also a very talented embroider. I really liked her as the main character and thought she developed very well throughout the novel. I loved that she followed her dream of working in the king’s city and that she helps to fix what she wronged. I believe that she would make a great role model for any child. There are other characters as well including Marta, who becomes Creel’s best friend, as well as Luka. Luka is the brother to the crown prince and is also a very likable character. He is really nice and doesn’t care where you are from or what your status may be. He treats everyone with respect, and I think he would make a better king than his brother. There are also tons of dragons in the story! Jessica Day George puts a different spin on her dragons, which I found fascinating. They don’t hoard the typical treasure you read about in other stories such as gold and jewels. Some of them hoard shoes and others go as far as hoarding live dogs. It’s hilarious! I also liked how they all have their own personality and become characters you really enjoy reading about. There are times when things happen to some of the dragons that almost brought me to tears. It was a great story and I can’t wait to start the next one! I would recommend this to anyone who loves fantasy, especially younger girls. It is a really girly series, but there may be some boys out there who would enjoy it anyway. It would be appropriate for anyone eight and older, and may be a perfect bedtime book for parents and children to share. I would have to say that the younger you are the more you will probably enjoy the book, but I think it is still a fun read for young adults and adults as well. I’ve read (and loved) the enchanted forest chronicles and have had these sitting on my shelves for ages. I am so excited that you liked the first one!! It feels like I just received a gift because I already own them lol.